I always, always buy too many bananas. At any given time I have a pile of spotted yellow fruit looking sad and forgotten on my counter. Since I haven't figured out how to not buy so many I've gotten really good at making Banana Bread. This time, much to my surprise and chagrin, I only had two rotting bananas and not the three that were needed. I often substitute apple sauce or apple butter to make up for any lack in banana, but I had neither. I did have, however, some Chestnut Jam. The recipe I follow (kind of) is in my old New Betty Crocker Cookbook. This page, as you can see, has been a go-to page for may moons. So as to not publish their recipe, I'll just tell you my little tweaks that have worked for me all this time. - If I'm short on the 1 1/2 cups of banana that is called for, I make up the difference with Apple Butter, and not quite so much with Apple Sauce (because it's more wet. You don't want to add too much water to the mix). In this case, I added 3/4 of what was the remaining mashed ripe bananas that was needed with the Chestnut Jam. - I line my loaf pans with parchment paper instead of buttering them. I find it to me easier to remove the loaves when they are done. It's like a giant cupcake cup. - I cook the bread for 40 minutes at 350º, NOT the 1 hour that the recipe calls for. If you do that you may as well pull out your hockey stick. 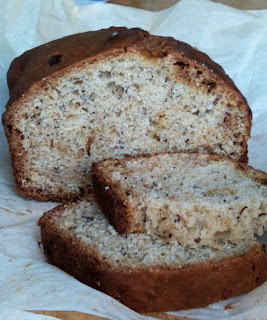 Banana bread makes for good breakfast as well as dessert. 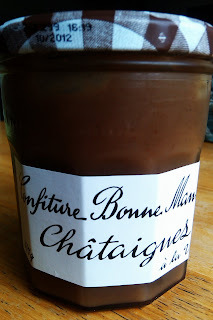 I toast a slice for me and top it with (surprise) Bonne Maman peach jelly, or Neutella for Lorelei.